CNY is celebrated all around the globe among many Asian communities. It’s also called the ‘start of spring’, or ‘spring festival’ （春節）. As a celebration of reunion of family and the joy of a new start, Chinese new year is a fun and exciting festival for children to learn more about the Eastern culture. Here’s what you need to know about the lunar Chinese new year, as well as our picks on fun and easy new year crafts you can try with your kids! Spring cleaning – Traditionally, an annual fresh start is symbolised in the big spring cleaning of CNY. Before the first day of new year （年廿八）, rooms are swept from the door to centre, with trash being dumped through back door. Families around the world would thoroughly cleaning their homes, hoping to get rid of bad luck from previous years and fill with good luck. Reunion dinner – Family members and relatives who may be working abroad will return to their hometowns for the classic reunion meal. Eating together as a family is an important element in Chinese culture, especially during the new year. Guests and relatives will be greeted with a wide selection of sweets, nuts and seeds in a box container (全盒; meaning a box of fullness). For the reunion meal, dishes will vary between different provinces in China; some classic examples include dumplings wrapped by the family members（餃子）, sweet or savoury cakes (年糕、蘿蔔糕，made with coconut milk, cane sugar or flavoured turnip), and glutinous rice balls as dessert (tang yuan, 湯圓). Red pockets (利是，紅封包）– you may have seen people handing out small red envelopes around Chinese new year time. These ‘lai-see’ (利是）（or ‘Hung Fung Bao’, 紅封包 in mandarin) red pockets are filled with money, and handed out during the first 15 days of CNY: from older to younger, from bosses to employees, or from leaders to underlings. Red being a symbolic colour of happiness in Chinese culture, the gifting of money in envelopes signifies gifting of good luck and wealth. Chinese new year is also a great chance for kids to get creative with DIY art and crafts. 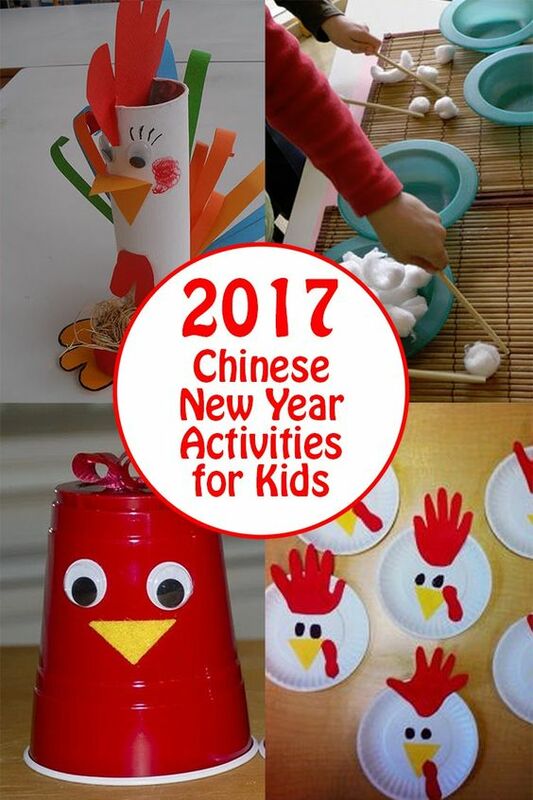 Try these new year, rooster themed crafts and activities with your kids and celebrate the spring festival with fun and easy-to-make decorations. This time of the year is a great opportunity to teach children about China and its rich culture. Artsy Craftsy Mom has picked out the best 60 Chinese new year crafts, books, and activities for kids. Check out these rooster themed DIY ideas selected by Tips from a Typical Mom blog that will guarantee a fun and creative Chinese new year craft session! On the first day of new year, relatives and family friends will visit each other in new clothes and shoes. Greeting phrases are a must from underlings to the elder generation. These are the most common greetings (in cantonese and mandarin) that you will hear everyone say during the new year. Sum Seung Si Sing（心想事成） – may all your wishes come true! Man Si Yu Yi (Wan Shi Ru Yi!) (萬事如意) – may life work in your favour and just as you desire. Share this post to your families and friends, and let’s enjoy the Chinese new year celebrations together this coming week. Happy Chinese New Year and we wish you happiness, prosperity and longevity in the year of the Rooster!